In addition to guiding, I run about twenty-five, two day fly-fishing schools for novice to medium ability students, per year. In addition to these I also run about six three day courses, catering to advanced students. How to select a good fly rod. Knots. Selecting the right fly-line. Accessory equipment. What to look for in fly-line. Nymph and dry-fly fishing. Reading the water, in streams, rivers and lakes. Correct leader construction. Entomology, (what trout eat, and what flies to use). Fly-casting, including roll casting, pick-up and put down casting, false casting, shooting line and line control. Morning and afternoon teas and a light lunch will be provided and for those who require equipment, top of the range Sage and Loomis can be provided, although you may use your own if you prefer. is professionally run; I have a qualification as a Certified Fly-Casting Instructor, from The Federation of Fly-fishers U.S.A. It is the experience of the students that they learn in two days, that which would take them about three years on their own. I am also able to offer an advanced fly fishing course. The course is one full day Advanced Fly-casting Tuition. On the second day, in the morning, we practice the presentations on a local stream. In the afternoon, we have a fly-tying clinic under the instruction of professional fly-tyer, Reg McLintock from Mainstream Flies. We have two instructors for this course, which covers a wide range of advanced casting, such as slack line presentations, reach mends, parachute casts, curve casts, double hauling, and other techniques for distance casting and handling windy conditions. We also do some advanced Entomology along with some advanced leader construction. The cost for this course is NZ$250 and includes morning and afternoon teas, together with tuition. You will need to provide your own lunch. 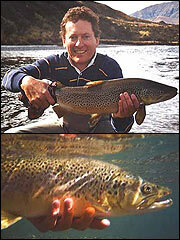 This is a Two Day Fly-Fishing Course and has limited numbers.